I find that the younger group of golfers in America only play golf in stroke play tournaments, and are not exposed enough to the tradition of match play. There are so many differences in strategy when you are playing match play then when you are playing in a stroke play competition. Typically when playing stroke play it is you against the course, even when you are in the final holes of a tournament, and it is down to you and one of your playing partners… you are still playing against the course. Now you might have some differences in strategy when you are playing against one or two players rather than a full field event, but there are huge differences in match play. Match play the course doesn’t matter, your score doesn’t matter, the only thing that matters is finishing the hole in less strokes than your opponent and winning the hole. The Ryder Cup and the Presidents Cup use to be the only match play events that the professionals played in. Now with the WGC playing a top 64 players in the world match play event every year and the Brits have their own match play event now, we can see that match play is becoming more popular in professional golf. 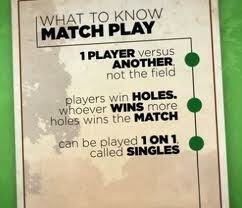 But where can amateurs play match play? Well the CDGA and the USGA both have plenty of Match Play events, most club championships at private clubs are match play events and some public courses still have club champions that have won through the art of match play. Many city championships (such as Naperville City and the Aurora City Golf Tournaments) have a match play tournament. The 2012 US Amateur is the most important and prestigious match play event for the amateur player. The US Am is what all young golfers aspire to reach. However the US Am is typically for collegiate players who are aspiring to become PGA Tour players, so the average 30 something guy (namely the Chicago Golf Guy) who has the competitive bug really doesn’t stand a chance with those young guns or does he? The US Mid Amateur is for amateur golfers over the age of 25. What the USGA created the Mid Am for is the amateur golfer, who wanted to compete at the highest level but never has an aspiration to turn professional. Most golfers after the age of 25 don’t turn professional, therefore the Mid Am is the best way for older amateur golfers to compete. The US Mid Amateur this year is being played right here in Chicago at the beautiful Conway Farms in Lake Forrest, IL. The US Mid Am has competitors qualify over a few stages: a regional qualifier, a grueling stroke play tournament at Conway Farms to decide on the top 64 players who will go to match play, and then the actual match play tournament where players must win their match in order to advance. Once you reach the match play portion of this event…all you have to do is beat the best Mid Amateur players one by one (six total matches) until you are the last person standing (literally standing because you cannot take a cart). Piece of cake. The winner of the US Mid Am will earn a spot into the Masters tournament, as well as eternal golf and Wikipedia glory as the Mid Am champion, and a spot in the Masters. Did I mention the Masters? How else does the normal guy get a chance to play in the Masters Tournament? No other way for an amateur to get into the Masters than to win their way into the event by playing in one of the many match play events that the USGA hosts. Next time you are out with your buddies try a new gambling game that is as old as golf itself. Don’t have a stroke play game, play 18 hole match play for $5 or drinks after the round. Go all out when you play match play as well. For example you cannot tee off first if you did not win the previous hole or the last hole that was won. You cannot play out of turn in match play (if you do your opponent can ask you to replay the shot, and that only happens when you play out of turn and hit a good shot…so be aware of who is away…when in doubt ask). You can coincide putts to your playing partner, and he can coincide putts to you. Learn some of the strategy of going for a par five in two after your partner has gotten close on his second shot. Or maybe you lay up a shot that you would normally go for only because your opponent has hit one in the water off of the tee. Why try to make that par putt when a two putt wins the hole. Remember that match play is not a total score, but who has won the most holes. Match play is truly the only way to measure your self against another golfer (that is besides by height). For Match Play is you against your opponent in the thunder dome of all golf. Two men enter but only one man can leave victorious. Next Whats wrong with the American Ryder Cup Team? 2014 US Mid-Amateur is being played at Saucon Valley CC in Bethlehem, PA. CFGC had it in 2012.